I wonder how many were really there? They lie and cheat at everything. thats too funny...someone pulling legs here I feel. I wonder what some of them are looking at ?? 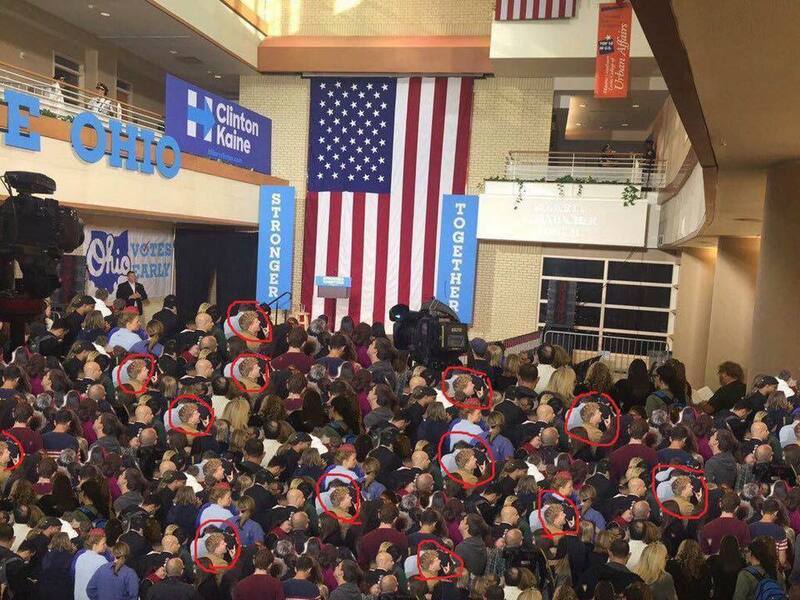 Hey ya go Trembles...I got bored and decided to look for more duplicates...seems the Killary crew are getting a tad desperate and are trying to say 'we have heaps of supporters'. Look at all the "zeros" in that picture. Got to say, there are Trump-Pence signs all over our area. Yet to see a Clinton sign in a yard. Did see one bumper sticker but it was next to an Obama sticker. Yup- Billary signs don't last long up here...less than two hours on the last one! Someone literally covered it in TRUMP decals! Thats bloody scary guys. Im bloody glad Im not voting in an American Presidency. Im glad I live down under because neither of them is right for the free world IMHO. Surely a country as big as the US can find someone better than either of them! I know I know , money talks BS walks…..